Nominated for 6 awards, of which it won 3. Nominated for Best Picture (Robbie Brenner, Rachel Winter), Best Film Editing (John Mac McMurphy, Martin Pensa), and Best Original Screenplay (Craig Borten, Melisa Wallack). Won Best Actor (Matthew McConaughey), Best Supporting Actor (Jared Leto), and Best Makeup (Adruitha Lee, Robin Matthews). I have heard a lot of rave reviews of Dallas Buyers Club, many stating that it is a story that needs to be told, but mostly that the acting is out of this world. I was very young during the time period of this film (beginning around 1985 and going into the nineties) and don’t remember anything about the AIDS crisis. I have little to no personal experience with it and therefore it hits me in a less personal way. I am very glad that I watched the documentary How to Survive a Plague before I watched Dallas Buyers Club because this film is more about the characters and a small populace of affected people whereas the documentary had a lot of facts and really represented the numbers and scope of the epidemic well. Dallas Buyers Club is a character driven film with very few side plots. There are a lot of small rolls and a few big ones, but McConaughey and Leto are, in my opinion and beyond contention, well deserved of their wins at this years’ Oscars. I was on the fence about McConaughey at first but he slowly won me over. His character, Ron Woodroof, is a genuine cowboy in Texas. An electrician by day and a rodeo cowboy by night, he spends the rest of his time drinking, doing drugs, and sleeping with hookers. He is from the beginning shown as a homophobic southern man who perceives himself as quite the ladies man, but when he lands in the hospital from electrocution he is told that he has HIV and has thirty days to get his affairs in order. After a disastrous experiment with AZT, the only drug for HIV and AIDS that was undergoing trials at the time, Woodroof runs down to a doctor in Mexico who tells him and his now full-blown AIDS infected self to switch to vitamins and non-toxic medicines. He loses his job and is ostracized by his friends, so as a way to make ends meet he starts selling alternative medicine. In walks Rayon (Jared Leto), a transgender with AIDS who ultimately opens the homosexual market to Ron. While fighting the FDA and selling medicine, Ron fights for his life, with a little bit of innocent romance on the side. He becomes taken with the only doctor who seems to care about the patients and about AZT’s toxicity–Eve (Jennifer Garner). In a lot of ways I can understand why this story needs to be told, but more than anything I marvel at the performances of McConaughey and Leto. Both men lost an exorbitant amount of weight to portray the roles well, which in turn affects their performances. The moment when Ron realizes the weight of his condition is truly poetic, which is actually a flaw throughout the whole film. It is more poetic and artistic than raw, which makes the story lose some of its impact. It is complicated to explain, but its editing and general flow of story, as well as its use of flashbacks give some of the plot an ethereal quality that pulled me out of the film. Leto seems to have a moment every time he is on screen. 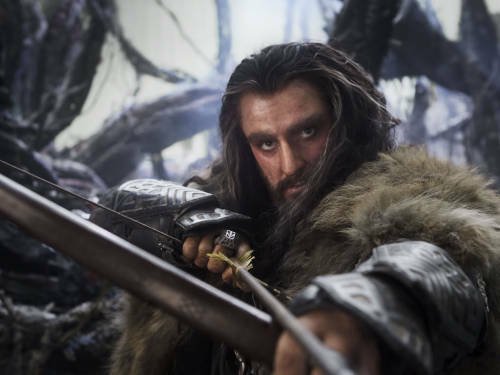 It is not just the type of character he is portraying, but the way in which he does it. His makeup and costuming certainly lend to the character but Leto inhabits and commands it. From a playful, unabashed personality, to addiction and pure despair, Rayon was generally a very strong character with a smaller role than I expected. He is leaps and bounds above his competition from this years’ nominees and I would watch the film again just to see his performance. 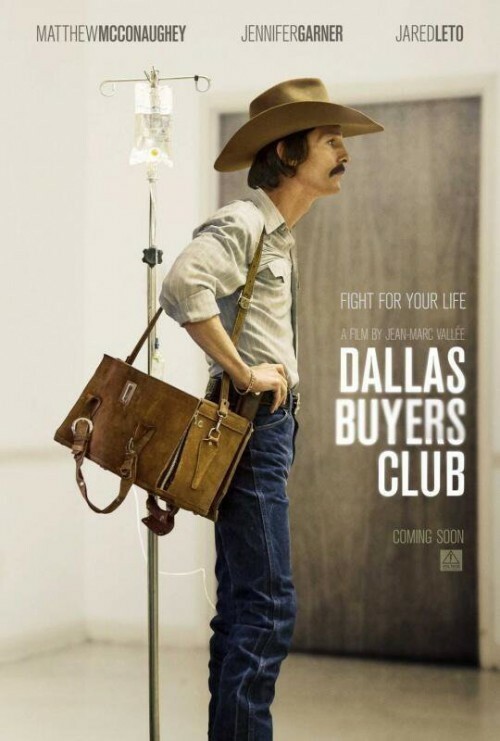 The Dallas Buyers Club is rated R and has a heavy topic with some explicit scenes. Enter into it knowledgeably. If you don’t know anything about the AIDS epidemic you might want to do a little reading before you watch the film because it doesn’t represent the magnitude of the situation that well. Otherwise, of just Leto’s performance alone I would recommend the film. Nominated for 8 awards, of which it won 3. Nominated for Best Picture (Tim Bevan, Eric Fellner, Debra Hayward, Cameron Mackintosh), Best Actor (Hugh Jackman), Best Music–Song (“Suddenly”: Claude-Michel Schönberg, Herbert Kretzmer), Best Production Design (Eve Stewart, Anna Lynch-Robinson), and Best Costume Design (Paco Delgado). Won Best Supporting Actress (Anne Hathaway), Best Sound Mixing (Andy Nelson, Mark Paterson, Simon Hayes), and Best Makeup (Lisa Westcott, Julie Dartnell). This adaptation of Les Miserables is both deeply loved and deeply hated by many–critics and citizens alike. The enchanting music and performances are beautiful, but the dutch angles* and static camera work is grating. For some (book lovers, mostly) the first two parts of the film are what they should be, if a musical can be considered a good representation of the original literature. For others, the last act is what makes the piece. For myself, the first two thirds of the film were incredibly boring. There are certain pieces that stand out, but over all it isn’t something that I would be able to watch very often. For those who don’t know, Les Miserables is a story about a man named Jean Valjean (Hugh Jackman) who is set free from prison and hard labor after serving 19 years for stealing a loaf of bread. Javert (Russell Crowe) is the guard who sets him free, but Valjean’s papers label him a dangerous man, which make it impossible for him to get a job, something to eat, or a place to stay. He is shown incredible kindness by a godly man who tells him to turn his life around. Valjean creates an alias for himself and years later we find him a factory owner and the mayor of a small town. This happy world is rocked when Javert returns, now as an inspector, although he does not at first recognize Valjean. Distracted by the new inspector, Valjean doesn’t take notice when one of his factory workers is thrown to the streets because she had a child out of wedlock. Fantine (Anne Hathaway) enters a dark path and in her deepest despair performs the most heart wrenching, memorable solo number of the entire 158 minute film. 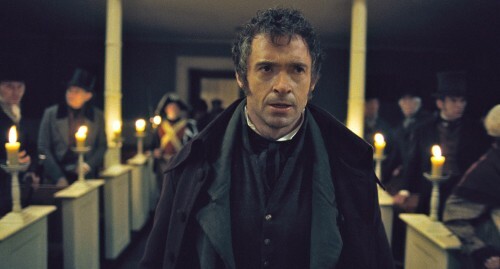 Valjean learns of Fantine and her daughter Cosette (Amanda Seyfried) and vows to take care of the girl. In the next act, a rebellion against the crown in stirring in France. Cosette is a young woman and her beauty attracts another young man who has left behind his family wealth to support the revolution with his friends. Marius, played by the freckle-faced tenor Eddie Redmayne, sees her but once and is in love. He must choose between the girl and the revolution. When Valjean discovers the romance, he must choose between his own freedom or Cosette’s happiness. 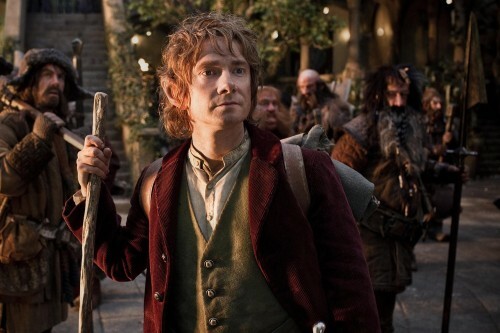 The film’s biggest strength is director Tom Hooper’s decision to have the cast sing live. Normally with musicals, they record the tracks before they shoot, but with singing live the actors have a much better opportunity to connect emotionally with their characters and their performance. There is no debate that Hathaway’s performance of “I Dreamed a Dream” is the best point in the entire film and it is undoubtedly what won her the Oscar. The film captures the darkness of the circumstances, but its biggest flaw is probably the conversion of stage to film–it stays too true to Broadway. The continuous musical ballads draw out the emotions of characters that we as an audience can see in a split second simply from the actor’s face. We spend five minutes exploring a single emotion. On stage this can work brilliantly, especially if you’re sitting in the nosebleed section. Film is different. The slightest flicker of emotion can be detected by your audience–we don’t need to marinate in it. My second favourite performance is when Redmayne sang “Empty Chairs at Empty Tables.” He expresses perfectly the emotion–the devastation he felt at the loss of his comrades. The film also did well in showing the sorrow that the soldiers must have felt at killing such young men. There are so many facets to this film, it is hard to discuss them all. For me, the first two parts of the film were slow and tedious. They did not hold my attention very well. If it wasn’t a musical I probably would have enjoyed it, but when there is little to no dialogue, it gets old fast. Part three, which many critics disliked, was my favourite. By then I was used to the singing and although certain love stories were a little silly, the character interaction was much more engaging. The revolution was interesting and its toll was disheartening. If you are a fan of musicals, you will probably love this film. If you hate musicals, you will hate this film. There isn’t really an in-between with this Les Miserables. I will probably see it again, simply because it is so well loved, but I hope it isn’t any time soon. *Dutch Angle (or dutch tilt) is defined as “a type of camera shot where the camera is tilted off to one side so that the shot is composed with vertical lines at an angle to the side of the frame” (Wikipedia). Nominated for Best Makeup (Haward Berger, Peter Montagna, Martin Samuel). Alfred Hitchcock is a legend in the film industry. From Birds to Psycho, his influence has probably reached every filmmaker since his time. For anyone who is a fan of his brilliance and for anyone who holds him in high esteem, the film Hitchcock is said to fall very short. As for myself, I have seen very few of Hitchcock’s masterpieces, and because I watched them before I was remotely interested in film as anything but entertainment, I feel I enjoyed viewing Hitchcock perhaps more than his passionate followers. It is said that he was a very private man and this insight into his life would be very welcome had it been grounded in fact (and left out a certain affair type side story). 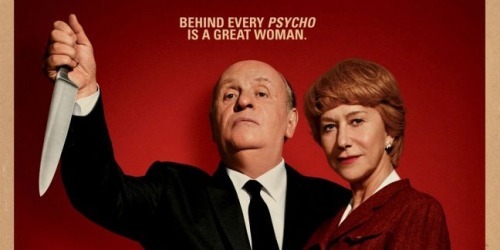 The 98 minute film follows Hitchcock (Anthony Hopkins) through his journey of shooting and releasing Psycho, arguably his biggest career achievement. His wife Alma (Helen Mirren), although never credited, is clearly his backbone and a huge inspiration to his decision making. Coming off the release of a big hit, North By Northwest, Hitchcock is in search of a new story to sink his teeth into. Everything from the new Bond movie to an Anne Frank adaptation are thrown at him, but instead his interest is peaked by a new novel about a serial killer. He tells his assistant to buy every copy of the book in existence so that no one will know the ending to his next film. Despite hesitations from everyone surrounding him, Hitchcock decides to plow ahead, funding the film himself and barely getting the production company to agree to release the film. The plot of Hitchcock follows small stories on set involving different actors and producers, but the heart of the film is really the relationship between Hitchcock and Alma. Hitchcock seems always preoccupied by his blonde leading ladies and Alma is preoccupied by a handsome writer who seeks her help. The married couple have their own issues, and despite visible tension between them, they were clearly made for one another. They are both brilliant in their fields, but as is the case in many artistic and creative households, there can be many disagreements. The strength of the film tends to tip in the direction of both Alma Reville and Helen Mirren. Alma comes off as a powerhouse woman who has everything to do with Hitchcock’s success. She is imperative to his genius, although he hardly seems imperative to hers. The story becomes very one sided and those who are hoping for a riveting back story to Psycho will likely be very let down. Likewise, Mirren’s performance is nothing short of brilliant, whereas Hopkins and his nominated prosthetics did not hold my attention well. Scarlett Johansson has a small role as the star actress Janet Leigh. I really appreciated her work and thought she fit and played the part well. Jessica Biel‘s role as Vera Miles doesn’t have much screen time, but she does fine with what is given to her. The visuals of the film were slightly better than your average romantic comedy, although I did enjoy the costuming and, of course, the makeup. However, Mirren is the big stand out of the film. I may watch it again just to see her performance, but I think my time would be better spent watching the original Psycho itself. If you have a thing for tense romances or an itch for a small window in to Hitchcock’s life, then I would recommend this film for you. However, don’t tie all of your hopes and dreams to Hitchcock because you will likely be disappointed in the end. Nominated for Art Direction (Stuart Craig, Stephanie McMillan), Makeup (Nick Dudman, Amanda Knight, Lisa Tomblin), and Visual Effects (Tim Burke, David Vickery, Greg Butler, John Richardson). Save 2012, I have read the Harry Potter books every summer since my fifteenth birthday. I am one of those people who reads all of the books before the next movie comes out, dresses up as Hermione, and goes to stand in line for the midnight premier before most people get off work. I own the first four books in paperback and all of their bindings are taped and glued and will soon require rubber bands. I own the remaining three books in hard back because I picked them up at midnight the day they were released. What can I say about a film and a series that has been so near and dear to my heart for almost a decade? I didn’t quite grow up with it–I think I didn’t see the first film until I was fifteen because there had previously been a lot of stigma about reading a book about witches and wizards in my community. I didn’t even know who Harry Potter was until the fourth book came out and it was on the news. How could such a famous book have three before it and I had never heard of it before? After watching the first film, however, I was hooked and never went back. However, I have always felt as if the films were a let down. Such is the curse of knowing the books too well. When something as “small” as the color of Harry’s eyes is done incorrectly, the whole world shatters and one loses faith in the filmmakers. When the actors that have been chosen to play the three main characters are pretty near hopeless in front of the camera, there is something wrong. Despite their flaws, the Harry Potter films are always worth watching in my opinion. In fact, because I haven’t read the books in a longer time than usual, I might appreciate them more. One of the biggest things that endears them to me still is the fact that we watched Harry, Ron, and Hermione grow up on screen. Just as they grew into the people J.K. Rowling intended them to be right before our eyes, the actors who played them grew in their skills and understanding of the characters so much that they are acted as if they are one in the same. By the end of Harry Potter and the Deathly Hallows: Part 2, I can hardly think of Emma Watson, Rupert Grint, and Daniel Radcliffe, because they don’t exist any more. 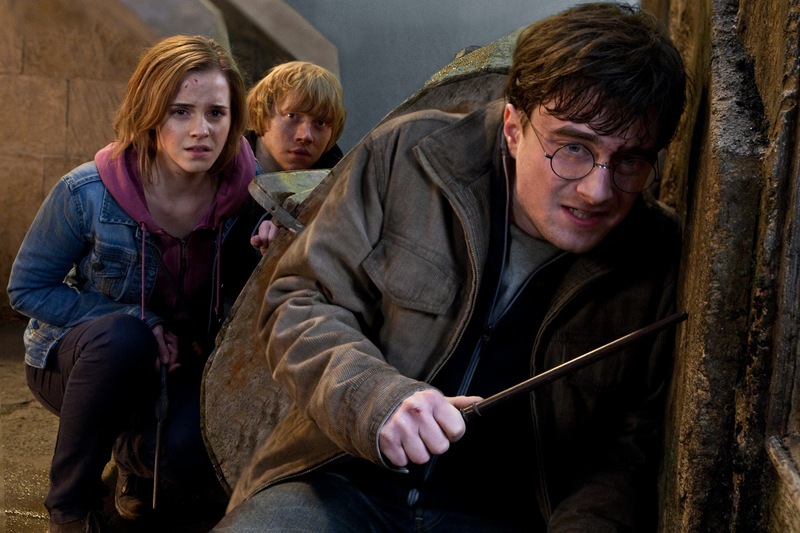 They have embodied their characters so well that no one else in the world could ever be Harry, Ron, and Hermione. The two Deathly Hallows installments are on a completely different level from the films before them. From an artsy, character study, true to the book sort of aspect, I preferred the first installment. However, from an action, well adapted, very visually cinematic sort of aspect, I thought that part two did the book extreme justice and am incredibly pleased with it as the last film. For the first time out of all eight films, all loose ends are tied, all plot lines are closed, and Voldemort is finally finished. There is no cliffhanger or promise of more adventures next year. There is promise that life and love will go on, but we are given a glimpse of that life and then our Harry Potter journey is complete. Though bitter sweet, I can’t believe that it could have been done much better. The beginning of the film is slightly abrupt due to the fact that we jump right in after part one. The initial conversations to establish the rest of the film are a bit slow, quiet, and tedious, and for those who haven’t read the books they are a bit confusing. Once the trio gets up and begins searching for horcuxes again, however, the pace picks up immediately and it is a non-stop ride until the end of the film. If you don’t know what a horcrux is, it is an object that contains a bit of someone’s soul and therefore the person to whom the soul belongs is unable to die. Voldemort believes that seven is the most powerful number and has made himself as many horcuxes, which means it has taken Harry, Ron, and Hermione exactly two and a half movies to track all of them down. Through the heavy complexity of J.K. Rowling’s last book, this film is lighter in its story and is drawn much more to the visual action sequences. I appreciated the wordless communication of much of this film, and indeed the most powerfully moving sequence involving Snape’s past needed little narration to be so brilliant. The acting is superb and all of the adult supporting cast is at their best, again mentioning Alan Rickman, but also Maggie Smith whose line “I’ve always wanted to use that spell!” was my favourite in the film. 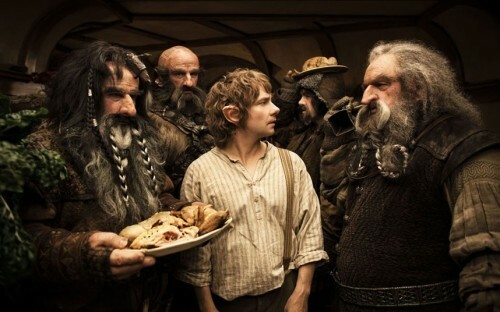 What was adapted so well and true to the book in part one was done equally well in the second. Many might disagree because the final confrontation between Harry and Voldemort was quite altered, but I actually believe that the added elements were, one, more cinematic, and two, more realistic. I actually found that part of the book a bit of a let down, and was pleased that movie-Voldemort puts up such a good fight. After all, he is a brilliant wizard, despite how he has misused his genius. All in all, I would count both parts one and two of Harry Potter and the Deathly Hallows to be among my favourite movies, and although I would not quite as readily vouch for the six movies preceding them, I would recommend movies seven and eight to anyone. Please see them, buy them, own them, and love them! The end has come, but for the next generation it has yet to begin!